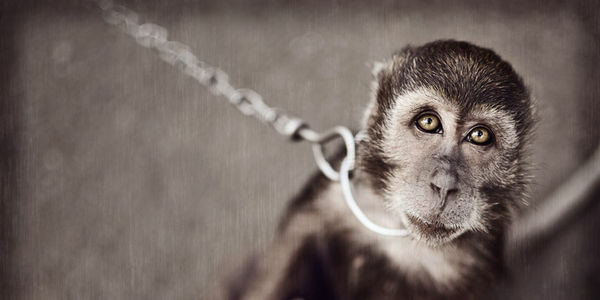 petition: Thailand: Free Chained and Caged Monkeys Forced to Perform Tricks for Tourists! Thailand: Free Chained and Caged Monkeys Forced to Perform Tricks for Tourists! Visitors to the Chiang Mai Monkey Centre in Thailand have reported a heartbreaking scene. Monkeys tethered by metal collars and chain leashes are forced to perform tricks such as riding bicycles, playing basketball, and doing push-ups to entertain tourists. When they are not performing, the monkeys are chained to trees or cages where they cannot move more than one or two feet. Reviewers on TripAdvisor have written that the "monkeys aren't happy" and described the Centre as "horrific." Visitors have stated that they "felt ashamed to take photos" and "could hardly watch" the abusive treatment. YouTube footage from 2015 shows a fearful monkey on a chain riding a bicycle in circles. According to the Wildlife Friends Foundation Thailand (WFFT), most animals used in Thai tourism have been kidnapped from their families in the wild. They are now dependent upon their human handlers and perform out of terror. The WFFT commented to The Dodo, "[The animals] are malnourished and imprisoned as slaves for their short span of useful life, then killed or abandoned to make way for the next money making animal." Please join me in urging the government of Thailand to shut down the abusive Chiang Mai Monkey Centre and send the animals to an accredited sanctuary. These intelligent, sensitive animals are suffering and scared – they desperately need you to speak up for them IMMEDIATELY! Please sign and share this petition right away! I am deeply saddened and disturbed by the cruel treatment of monkeys at the Chiang Mai Monkey Centre. Monkeys tethered by metal collars and chain leashes are forced to perform tricks such as riding bicycles, playing basketball, and doing push-ups to entertain tourists. When they are not performing, the monkeys are chained to trees or cages where they cannot move more than one or two feet. I am writing to respectfully ask that you shut down this Centre immediately and send the monkeys to an accredited sanctuary. Reviewers on TripAdvisor have written that the “monkeys aren’t happy” and described the Centre as “horrific.” Visitors have stated that they “felt ashamed to take photos” and “could hardly watch” the exploitation. I do not believe that these animals should be so cruelly treated for the purpose of human entertainment. Around the world, there is growing disapproval of animal exploitation. Please show the world that Thailand is a leader in the emerging consciousness to respect wildlife by closing the Chiang Mai Monkey Centre and giving the animals a second chance at a free life. Thank you so much for signing my petition to help imprisoned monkeys in Thailand. Your signatures have been delivered to the appropriate Thai government officials. With more than 82,000 signatures, I am hopeful that we can make a difference for these suffering animals. Please keep sharing this petition - I will resend it when we reach 100,000 signatures. Thank you again!